There is a specific reason why I chose this title. There are two distinct actions that have been taken this week in Washington regarding Issues in Africa. The First Part is New Legislation was Introduced in the US Senate that Deals with an Important but Highly Underreported Root of the Crisis in the Democratic Republic of the Congo. The Second Part is a Statement by the New Undersecretary of State For African Affairs Johnny Carson. Lets say it appears that it is once Again 2006 in Somalia. First of All is the Congo Conflict Minerals Act. This is a Bi-Partisan Introduced Legislation that seeks to Address One of the Root Causes for All that ills the Democratic Republic of the Congo. The Sponsors Include Sam Brownback Republican from Kansas, Russ Feingold a Democrat from Wisconsin and who is the Chairman of the African Subcommitee on the Senate Foreign Relations Committee and Charles Schumer a Democrat from New York. What is the reason why this Legislation is currently needed? Key Components for Electronic Devices are made from Raw Materials Extracted from the Conflict Prone Eastern Part of the DRC. In Essence it is alledged that Multi-National Coporations are Profitting from the Suffering of their Fellow Human Beings. What Materials will be Covered? According to the Legislation the Origin of the Country where purchases of Gold, Coltan, Casserite (Tin Ore) and Wolframite are Made From. The Legislation will require such information be disclosed to the Securities and Exchange Commission. It is believed that the sales of these Minerals are funding various Warlords and Militia Groups that literally Run Affairs in the Eastern DRC. At this time the Consumer Electronics Industry has had a tepid response to this Legislation but have indicated that they will work on this issue. US Officals will have a Lot on their Agenda in the Near Future when it Comes to Crisis Spots in Africa!!! In 2006 Ethiopian Forces entered Somalia to Prop up a Weak Western-Backed Government against an Islamic Insurgency. As Much as anything this may have been a key factor in the spike in the Acts of Piracy that Began in 2008. Fast Forward to 2009. Ethiopian Forces have left Somalia but a number of them remain along the Border in case that they have to return. A small contingent of AU Peacekeepers are in Mogadishu under a limited Mandate. A New Islamist Militia Al-Shabbab which some People maintain has close links to Al-Qaida has Power in the Southern Part of the Country. They have also threatened to Invade Kenya as well. Recently in an Interview with the BBC US Undersecretary of State for African Affairs Johnny Carson reiterated the Claim that Eritrea has been supporting the Islamist Militias in Somalia. 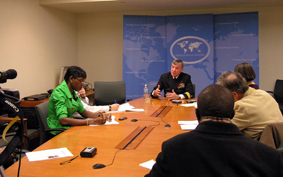 He stated that the US and the UN have "credible" Evidence of Eritrean Involvement in Somalia. This is one of the reason for the Tensions between the United States and Eritrea. Other Reasons are the Situation along the Border with Ethiopia and the Human Rights Record within Eritrea. There has been an increase in the Fighting In and Around Mogadishu and an Offer by the Government for a Ceasefire was rejected by the Islamists. This situation will be Monitored by the Confused Eagle.